If you are a native of India and in love with a person, you might not enjoy the support of your family for your marriage or may face stiff opposition. It might also be the case that your love belongs to a different caste, religion or nationality. In such cases, marriage becomes difficult, but not impossible- the Special Marriage Act 1954 comes to your rescue. This provision is also called as Court marriage. Court marriage is one, which is solemnized between persons of different nationalities, religions or castes. It operates in the marriage between two Indian nationals or a foreign national with an Indian national. Anyone must not be of unsound mind or suffer from bouts of insanity. The couple must not be within degrees of prohibited relationship. A notice for the intention of marriage must be filed by the couple in the district court where one person has resided for 30 days prior to the notice. The registrar for marriages then publicizes the notice to attract any objections. If no objections have been raised within one month of publicizing notice, the marriage can be solemnized. The wedding must be conducted at a particular marriage office. Both parties and three witnesses are required to be present at the solemnization of marriage. Residence proof of the couple. Application form in the necessary format along with the required fee. Photos of the couple in passport size. Residential proof and PAN cards of the three witnesses. Death certificate or divorce papers related to another former spouse. According to the Special Marriage Act, when spouses are from different religions, it is a civil contract. It does not require religious ceremonies. The procedure is invoked when either spouse or both spouses are not Hindus. Procedure and Documents required are the same. As per advice of advocate for court marriage, such a marriage can be solemnized by an Indian marriage registrar or a marriage officer in a foreign country. One person must be a citizen of India. The bride must have attained 18 years of age and the groom 21 years. Neither party must have another existing spouse. Either part should not have another valid marriage. Neither party must be an idiot or a lunatic. The couple must not be within prohibited degrees of relationship. Application signed duly by the parties. Evidence in documents of the date of birth of the parties. Passport Copy of the parties with valid visas. Proof of residence of both parties. Evidence of stay of more than 30 days in any district in India of either one party. No objection certificate on marital status from concerned embassies or Indian consulate. Divorce decree or death certificate whichever is applicable regarding the former marriage of any party. The notice is then published inviting objection to the marriage if any. The marriage shall be solemnized in the presence of at least three witnesses. 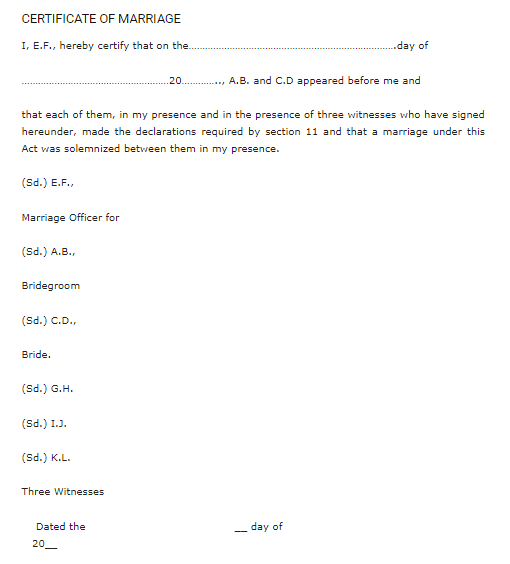 Further, the Marriage Certificate is entered and is granted by the Marriage Registrar. We have a huge experience in dealing with such cases. We at Advocateinchandigarh is helping the couple to perform the court marriage and procure the marriage registration certificate from the registrar on the same day.